Harvard Avenue Christian Church is grounded in three core values: Be Loved. Believe. Become. We strive to be a place of welcome for all people … live together in ways that express our faith … and look beyond ourselves to serve our community with all of our gifts and with all our hearts. We know that people come from diverse church backgrounds (or no church background at all), and honor the beauty that diversity reflects into our church family. We’re grateful to share the journey of faith together. At worship each week, we share in music, scripture, sermons, communion, and offering – acts of worship that draw us into relationship with God and each other. 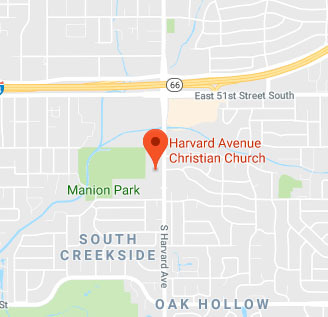 Harvard Avenue Christian Church is part of the Christian Church (Disciples of Christ) and shares in ministry and mission not only with the northeast area of the Oklahoma Region, but with Disciples throughout the United States and around the world. Our name, Christian Church, shows that we have a common bond with Christians the world over. Disciples of Christ identifies us as a distinctive body within the whole of Christianity. As ‘the Disciples’, our roots reach back to the early 1800’s when Scottish Presbyterians on the frontier of Pennsylvania and Kentucky, troubled by the feuding within churches at that time, yearned for all Christians to be united in a simple recommitment to a New Testament faith. We have no formal creed, but we profess a common faith that Jesus Christ is the Son of God, and we claim him as Lord and Savior. What that means, how it plays out in the life of each individual, and how it shapes the community, is worked out daily as we strive together to live faithfully into the ways of Jesus. People of many different backgrounds find a spiritual home here, because we value each person and celebrate the depth and breadth of diversity in which God has created us.